The inauguration of the new Quebec City Voltigeurs Armoury took place on April 26 in Quebec City, ten years after a fire ravaged the building built in 1887. Structure Fusion, a company that specializes in the design, manufacture and installation of solid and hybrid wood structures, is one of 700 contributors to the reconstruction of this historic building. 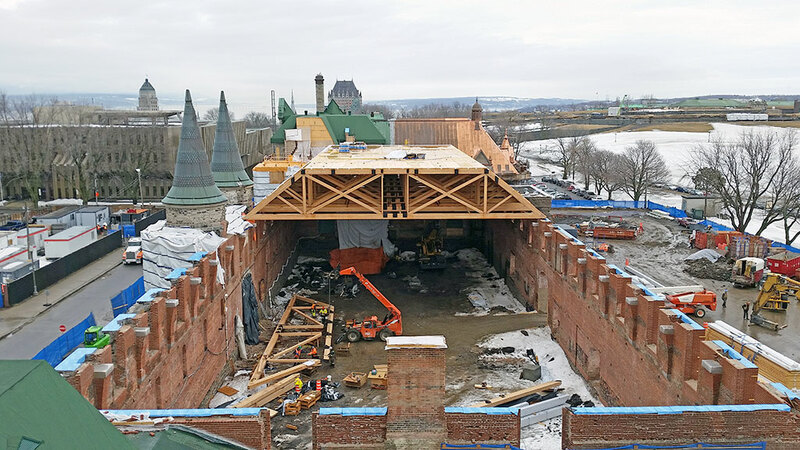 For the reconstruction of the Quebec City Voltigeurs Armoury, Structure Fusion supplied 15 glue-laminated trusses measuring 98 feet in length (29.9 meters) by 17 feet (5.2 meters) in height for a total weight of 96,000 pounds. “Since this is a historic building and there were no specific ‘as-built’ plans available, we had to make sure we took accurate measurements to make accurate and precise parts.” says Dominique Briand, General Manager of Structure Fusion. Multifunctional room that can accommodate up to 1,300 people. One hundred anchor points on the ceiling (capacity: 950,000 pounds). Stones replaced on the outer walls were taken in the same quarry as at the ones from the original construction. 10,000 soldiers from the greater Quebec City area will be able to take advantage of the new facilities. In the heart of Old Quebec, the Armoury is the only military building in Canada to be recognized as a national historic site.